Garret and Taylor's Wedding was a gorgeous burgundy and blush affair featuring lush, romantic florals with rustic touches. They were married this past fall at Bev's On The River in the outdoor area and had their reception inside the event hall. It was such a pleasure to work with this bride and her mother, as they were some of the most organized, efficient women EVER! Taylor teared up when I presented her with her big, wild bouquet complete with silk ribbon streamers (some of them from the famous Silk and Willow ribbon boutique). I loved the gorgeous local dahlias grown by Alissa's Flower Farm in Hull, Iowa mixed in with all of the ranunculus, foliage, and even a honeysuckle vine from my own cutting garden for a little whimsy. Her top knot hairdo was lovely with its hair flowers and trailing veil. The amazingly talented Jenni O Photography captured so many beautiful and special moments during the day that we just had to share some of these. Jenni is a fine art photographer, harnessing ethereal, natural light, artistic detail shots, and those intimate moments that are so inherent in weddings. Habitue's Cakes To Remember out of Lemars, IA provided individual cake centerpieces for her reception tables that we decorated with a touch of flowers. 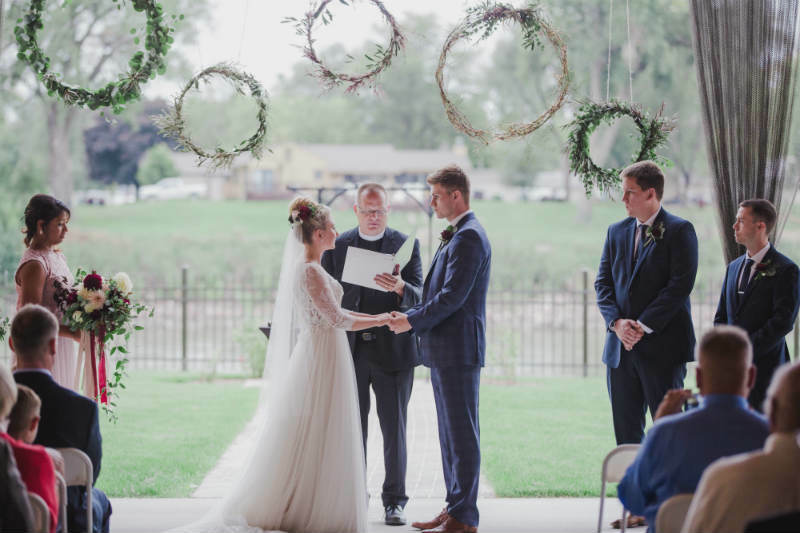 I also liked the rings suspended over the couple during the ceremony decorated in a variety of ferns, vines, and greenery. It was such a fun, creative process to help this family's ideas come to life and a pleasure to be part of this special day. As we are currently busy booking weddings for 2016 and 2017, I thought it would be useful to spend my annual floral design course focusing on the art of creating wedding bouquets. I have to say, this type of continuing education is sooooo much more fun than my CLE’s for law used to be! I have been making bouquets since I was a florist almost 20 years ago but the styles have changed, and I was dying to learn more about creating the open, airy, natural bouquets that are cropping up all over Instagram. The coasts are filled with florists creating the new “garden style” which I just LOVE. It is an organic, elegant style. It is artistic and tricky even though it looks perfectly natural and effortless. That’s the big secret and the big challenge. I have been making garden-style bouquets for two years but it is always important to keep learning. I am a student at heart, so seeking out knowledge is second nature to me. I would go to a floral design course every month if I could, but I usually settle on a few a year. I love connecting with other designers, learning new techniques, discovering new flowers, and finding new sources to order flowers from. It keeps me up to date on the newest trends and inspires me. My designs are always improving and changing, and creativity is a magnet for more creativity. With all of this in mind, I decided to search up a bouquet design course in the Midwest for once. So many of my design classes are on the coasts, but I wanted to meet a Midwest designer and talk to her about our special challenges of sourcing flowers, transportation costs, marketing, demographics, and such. After following Ashley Fox Designs of Minneapolis, Minnesota for over a year now on social media, I decided to ask her if she would do a class for a few of us. She kindly agreed and we arrived the end of February to the Twin Cities ready to soak it all in. Summer (Honeysuckle Hollow’s marketing guru, assistant designer, and stylist) joined me along with Alissa from Alissa’s Flowers (a flower grower in Sioux Center that I have become friends with and buy from in the summer). We had a great day filled with business advice, style boards, lots of bouquet instruction, gorgeous flowers, beautiful silk ribbons (from Silk and Willow), and finally a professional photoshoot at the end of the day to capture our work. There was a lovely model @katieclarko from @wehmannagency, a make up and hair stylist @empiriastudios, a local dress shop @thewhiteroommpls, dresses from @johannajohnsonofficial, @houghtonnyc, @shopgossamer, styling and instruction by Ashley Fox Designs of course, and the very talented photography of @amandanippoldt and @tarynchristinephoto. It was fun to watch the styled shoot take place in some great natural light of an old building. It was even more fun to get the photos back!!! Here are some of my favorites from what was created that day. I am still drooling over the romantic, dreamy images—many of which were shot in film. So artistic and a perfect representation of the style we were creating. Enjoy and pass on to friends who might be planning a wedding for inspiration…. Floral designs are student and instructor work. It was a wonderful day with so much beauty and information. I cannot thank Ashley enough for this opportunity she created for our small group. And the super exciting news… I was asked back to be an assistant for Ashley Fox’s bouquet class next spring!! What an honor and special opportunity to help and to learn even more from the very talented Ashley!! I can hardly wait. Well, we decided to do a booth in yet another bridal show. We thought going to Omaha might be a good idea: a larger population equals more potential brides! So I got to work making up some wild, natural beauty to take to the show…. Then Summer and I loaded up two minivans FULL of furniture and flowers from the shop and headed to Omaha. We were able to pull off another lovely booth with a cozy, house-like atmosphere. We had fun styling the 10 foot by 10 foot booth to present potential brides with a feel for the nature-inspired florals that we are known for. After setting up Saturday evening as scheduled, we got a hotel in Omaha while awaiting the show on Sunday morning. Here I am preparing a last minute bouquet at the hotel. Doing flowers in hotels is just part of being a traveling florist. I once had to store flowers overnight in a toilet full of fresh water!! It’s all about getting it done. Whatever it takes. Fortunately this hotel room had a nice kitchenette, which helped. The bouquet turned out lovely, and we cleaned up, grabbed some coffee, and headed to the Bridal Show. The day went smoothly, and we were lucky enough to be located by a lovely new photography company in Omaha….Gray Feather Weddings. If any one in Omaha wants some artistic photos from some very fun ladies, contact them at info@grayfeatherweddings.com. We networked with a variety of other wedding vendors and met some great potential customers who happened through our booth. Overall, we have had a lot of interest for this fall and next summer, and we’re busy with wedding consults this week!